WASHINGTON--(BUSINESS WIRE)--Job seekers take note: today’s employers have a great need for self-management skills like problem solving and time management, according to the latest Strayer@Work Skills Index. Analyzing select data provided by LinkedIn, the quarterly study identifies the country’s widest skills gaps in the financial services, food and beverage, healthcare, information technology, manufacturing, retail, and travel and tourism industries. 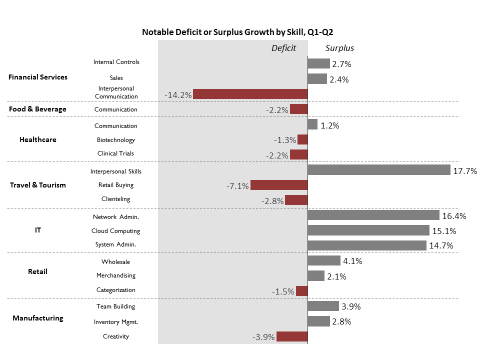 Programming skills and the ability to use enterprise software are also increasingly in demand. 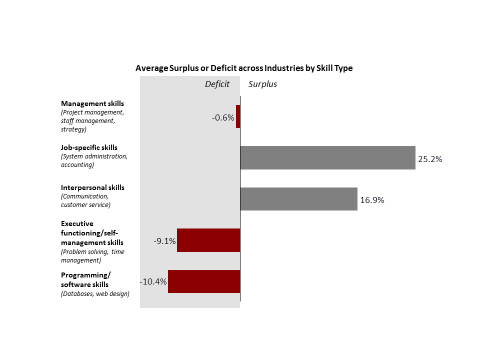 While skills gaps (high-demand from recruiters, but a low-supply of skilled candidates) exist in programming and self-management skills, there is a surplus of candidates with job-specific skills (accounting, financial analysis, visual merchandising) and interpersonal skills. “The Strayer@Work Skills Index provides important insights for both employees and employers. Job seekers who want to stand out in today’s talent market can use the tool to understand which skills employers want and then build upon those skills to gain a competitive advantage,” advised Karl McDonnell, CEO of Strayer Education, whose Strayer@Work platform helps companies close critical skills gaps through customized training and accredited degree programs. “Conversely, employers can use the Index to compare skills gaps felt within their own companies to trends in their broader industry, and then develop investment strategies for recruiting and employee development to remain competitive among peers,” McDonnell added. Enterprise software and programming skills are greatly needed in the healthcare industry. The financial services industry is facing a shortfall of professionals with programming and profit and loss management skills. Employees with knowledge of critical path method (CPM) scheduling and enterprise software are in high demand in the travel and tourism industry. “According to a study compiled by the Centre for Economics and Business Research, unfilled jobs cost the U.S. economy $160 billion each year. By determining specific skills gaps, we hope to provide valuable insights to equip both companies and employees to better invest in education programs and improve American competitiveness,” Terry McDonough, CEO of Strayer@Work said. “Even if a candidate or company doesn’t possess the in-demand skills right now, they can use the Skills Index data to make informed choices about what professional development opportunities to pursue, either through a company-sponsored learning program, a degree or certificate program, or an immersion program, such as a coding boot camp,” McDonough added. The skills gaps for clienteling and retail buying skills in the travel and tourism industry increased significantly from quarter to quarter. Despite interpersonal skills being in surplus when averaged across all industries, in the financial services industry, interpersonal communication skills are experiencing a growing deficit. To learn more about the Strayer@Work Skills Index and view the interactive findings by industry, visit www.skillsindex.com and follow the conversation on Twitter at @StrayerAtWork. The Strayer@Work Skills Index analyzed select skills in the public profiles of LinkedIn members in the United States who work in the financial services, food and beverage, healthcare, hospitality, information technology, manufacturing, and retail industries. It measures both the supply and demand of the select skills. The supply side of the formula measures how prevalent select skills are within the profiles of members in a particular industry, relative to the overall population of LinkedIn members in the U.S. 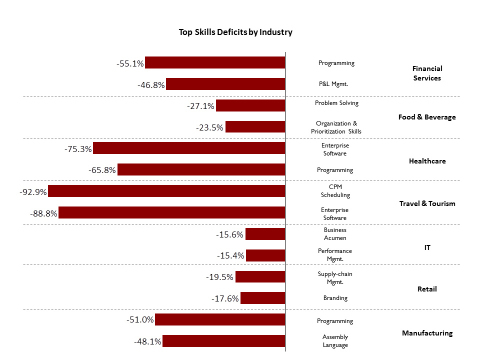 The demand side of the formula shows how desired select skills are within a particular industry, relative to its overall demand, as measured by U.S. members who received an InMail message from a recruiter within the past year. A negative index percentage for a particular skill means there is a shortage of people who have that skill to meet the industry’s demand. A positive index percentage for a skill means there is an oversupply of that skill within the industry. Strayer Education, Inc. (NASDAQ: STRA) is an education services holding company that owns Strayer University and the New York Code and Design Academy. For more information on Strayer Education, Inc. visit www.strayereducation.com. Founded in 1892, Strayer University is a proprietary institution of higher learning that offers undergraduate and graduate degree programs in business administration, accounting, information technology, education, health services administration, nursing, public administration, and criminal justice, to working adult students. The University includes Strayer@Work, which serves corporate clients by delivering the next generation of performance improvement and workforce development. Strayer University also offers an executive MBA online and corporate training program through its Jack Welch Management Institute. Strayer University is accredited by the Middle States Commission on Higher Education, 3624 Market Street, Philadelphia, PA 19104 (267-284-5000). The Middle States Commission on Higher Education is an institutional accrediting agency recognized by the U.S. Secretary of Education and the Council for Higher Education Accreditation. For more information on Strayer University visit www.strayer.edu. New York Code and Design Academy (NYCDA) is a New York City-based provider of non-degree web and mobile app development courses. NYCDA courses are delivered primarily on-ground to students seeking to further their career in software application development. NYCDA does not participate in the Federal Title IV lending program. For more information on NYCDA visit www.nycda.com. The Strayer@Work Skills Index uses select LinkedIn data to highlight skills gaps in top U.S. industries, including manufacturing and retail, among others.